Is fear standing in the way of your mission? Fear is a powerful emotion. It’s human nature to stay in your comfort zone, avoiding risk and hesitating to trying new things. Biologically, fear produces a sense of anticipation that something bad might happen. But, your fight or flight response can also be an indicator that it’s time to make a change, especially when it comes to advancing the mission of your organization. At Davidoff, we consistently challenge ourselves to recognize, acknowledge, and take risks to prevent ourselves from becoming our own worst enemies. We find the more we’re aware and conscious of our fears, the more we’re able to push past them and achieve breakthroughs. To break out of the comfort zone in the face of fear, we put together the following real-life situations we’ve encountered. We hope you learn from these lessons and are inspired to act in the face of your fears. Challenge: Over lunch with a client who chairs the board of an association, we learned that membership of the association had dropped by 50 percent during the past five years. To solve this issue, they continued to use comfortable tactics despite not getting a positive result. Analysis: The management team was risk averse. They were content to keep offering the same programs and benefits to members, even though their membership was rapidly declining. Solution: Turns out, their focus on supporting the association’s mission—that hadn’t been refreshed in a decade—challenged their survival. By simply becoming aware of what was driving the anxiety, pain and tense culture, we created strategies that addressed the real challenges. Challenge: There is a non-profit organization that provides food for the weekend to school children who might otherwise go hungry. The group gained success in specific regions and could have continued with their work. But, additional research into childhood hunger statistics demonstrated a dire need across the nation, not just in their region. Fear: Rather than let fear of the unknown limit their potential, they revised their business model to support national scalability. Solution: Inspired by the facts and focusing on their mission, they now feed more than 90,000 kids in 47 states. You can try to “think your way” out of challenges in your organization, but it can be difficult to look at situations differently when you’re “in it.” Experienced strategists lead organizations through the fear and anxiety, naming the assumptions and barriers to growth. 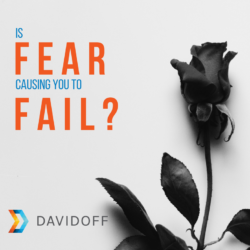 By incorporating Davidoff into the conversation, you have a partner to help you step outside your system and ride the wave of fear so that you become a more powerful leader.